What makes an artist a failure? While strolling through the Metropolitan I was viewing the wing piece of a more extensive altar and observed words etched into the golden grounds. This had a profound resonance with me because of my fascination and utilization of words in all of my work. Of particular interest was the lovely white lily that indicates Mary’s purity. On this same sojourn I witnessed the line out the door and around the block of people waiting to get into a contemporary artist’s retrospective. Is that success? My response began with one painting of lilies on gold with the word FAIL emblazoned on it. 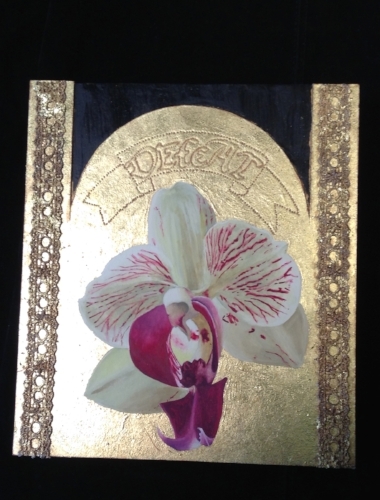 The series began;they are gold leafed egg tempera paintings of single flowers on board. Flowers are one of the magnificent expressions of nature and seem to me to be joyous to the point of being transcendental. Some works are constructed with gypsum board,most are on the backs of cigar boxes. There are evocative words embossed into their surfaces. They are an invitation to ponder.